The first concern that came into my mind when thinking about soaping with Pineapple juice is the enzyme level in this tropical fruit. 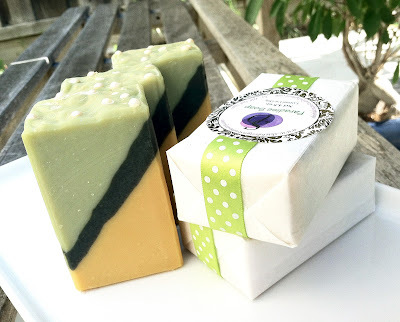 How is the enzyme and acidity going to effect my soap? With ??? in my head I started my experiments. I'm very please with what I got out of the fresh pineapple - ate some and juiced some for soap - but not without failure! Trial #1 I used full amount of pineapple juice, straight up, and oh boy~ Let me hide that from you... cuz you will be speechless too... in a bad way. Second time around, live and learn, I used half half method, meaning using half water to dissolve lye and half as pineapple juice. 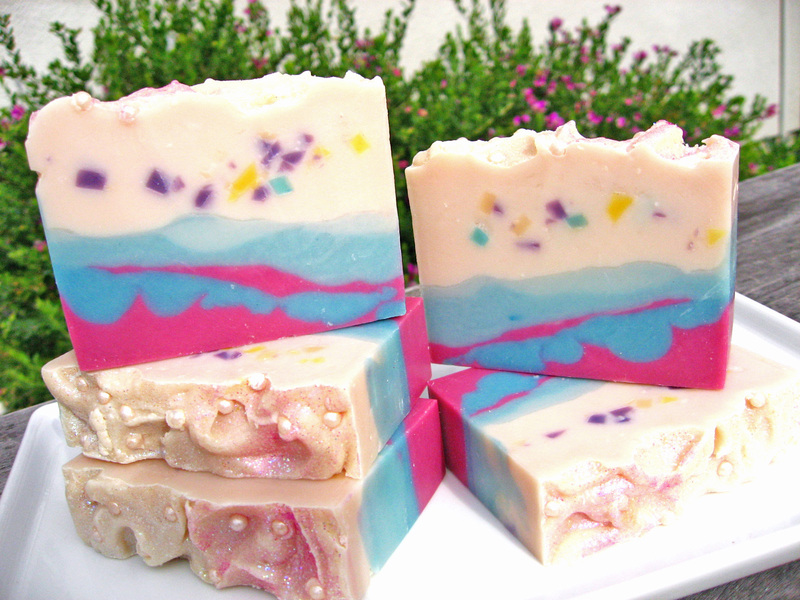 To stay with the tropical theme, I scented this batch with Coconut Lime Verbena, oh so yummy~ I simply just renamed it Paradise! The design on the other hand is more of my modern twist of layering. If you are interested in getting a piece of Paradise, I just put them on sale on my Facebook Store: Online Store Check my new store out! 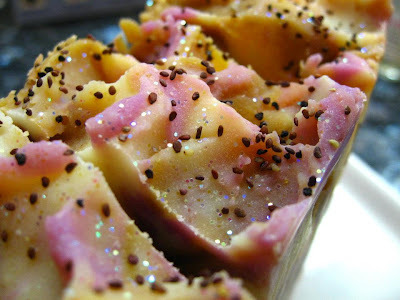 What does pineapple contribute to the soap you ask. Well, let me tell you one observation of mine, the second the scrap piece of soap hit the running water, it starts to bubble, it is so hard to hold down to the pill as I suspect the enzyme in pineapple makes everything so slippery! 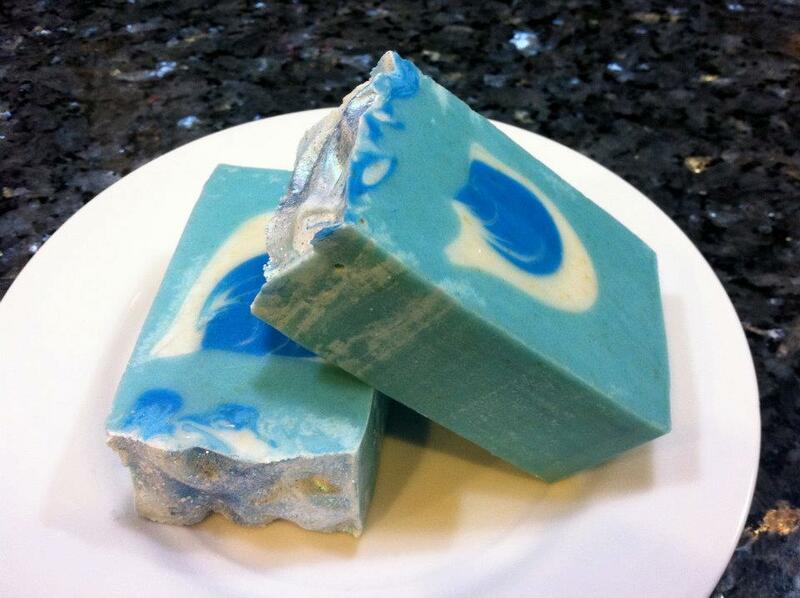 Even more so than adding Tussah silk in soap! I'm thinking, this can be formulated into facial soap for exfoliation! What else can I do to mellow out the enzyme? Present to you my #3, a combination of soy milk and pineapple juice. This one totally accelerated trace on me, proceeded to plan B right the way (oh~ am I trained to soap plan B these days! ), phew! This batch has the best of the 2 worlds, creamy from the milk and enzyme sugar bubble booster from juice! And did I mention this is totally vegan?! I scented this batch with my own tropical cocktail that's similar to Piña Colada but unfortunately the coconut did not survive saponification. It looks like Italian Gelato according to my hubby (why do men see everything in terms of food or sxx?!) but smell nothing like it. And this is my Gelato Twist which I blogged about in my last post. Did I get your attention now ladies?! 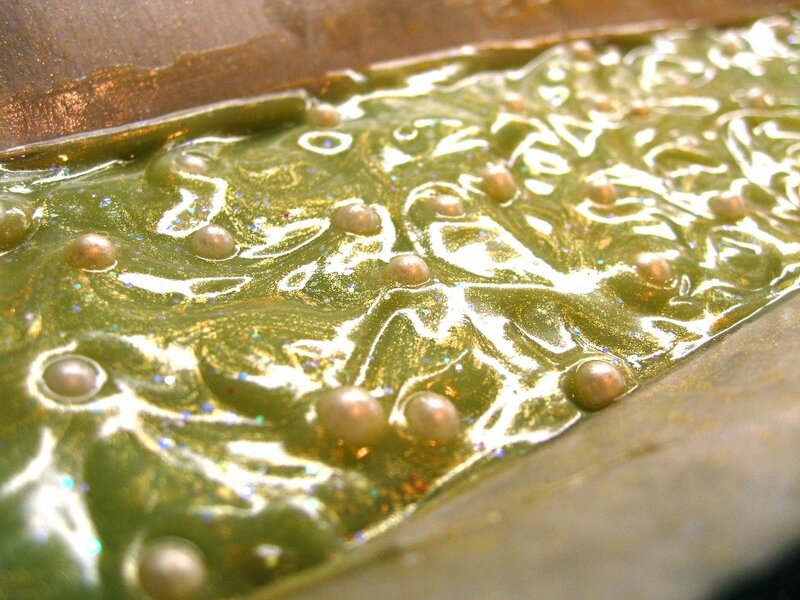 "The nacre of a pearl-producing oyster, whether found in pearls themselves or in the oyster's shell, contains the same essential amino acids that heal and maintain cells in the human body. Deficiency of any one of these key amino acids can cause skin to look coarse and wrinkled. Researchers who have worked to develop skin creams based on nacre claim that various components of pearl can stimulate the metabolic activities of the genetic material in a cell - the DNA and RNA - and thus can promote and accelerate cell renewal." By all mean I'm not making any claims! I'm Slacking Because Of The Sunshine! I admit, I've been missing in action on my blog which I post in average twice a week, sometimes more since I started. I blame this on the sunshine! We've been in crappy winter weather for so long! It has been gorgeous for the past week or so with lots and lots of bright sunshine! How can I stay indoor when the sun is calling for me outside?! I'm glad I went out and enjoyed it while it lasted, I hear it's going to rain, AGAIN! Despite all the slacking I still managed to make two batches of soap in totally different styles with the same new natural ingredient I'm trying out - coconut water. The first batch had so much promise, it was done in peacock swirl, but ended up ashing and discoloring so badly. I'm not going to show you how ugly it got, maybe next time when I finally accept the out come, LOL. Live and learn, the 2nd batch came out perfect! 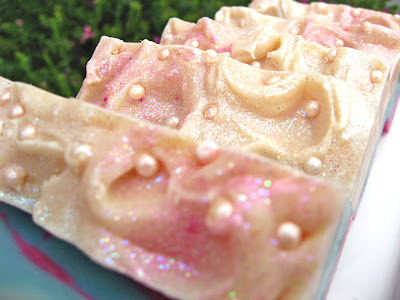 It's a mix of fragrance oils that smells spicy floral with hints of powdery honey! I present you Selena, the goddess of moon! This batch when poured, looks just like Italian Gelato (my husband's word when he saw it)! Made me want to just take a spoon and scoop some into my mouth, see for yourself! 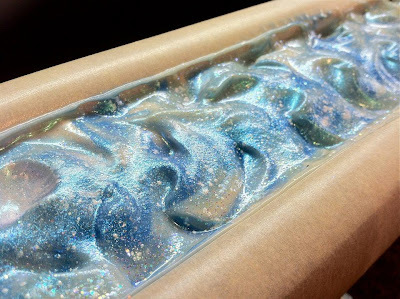 I really am debating for a long time what to call this soap. It is made with 100% soy milk and fresh pineapple juice and scented with a mix of fragrance that includes fruits and coconut. 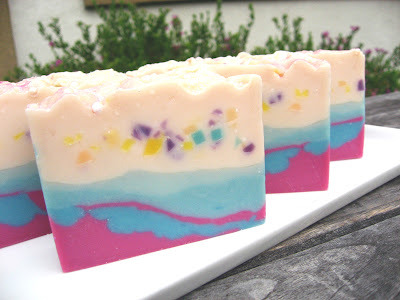 Some one from my soap maker friends had suggested the name Pina Soylada because of the pineapple juice and coconut scenting. Unfortunately the coconut note did not survive the lye... sigh. If any of you know a good coconut fragrance oil that can survive cold process soaping and not smell like vanilla, PLEASE let me know because I have not found one. The final cut bars smell like fresh spa filled with fruits. Any good name suggestion is welcome! Just got back from a trip to somewhere exotic, a country not many people have visited yet. It is Bhutan, a still very isolated paradise of natural beauty, where GDP (gross domestic production) is measured more in the terms of GNH (gross national happiness). What is GNH??? Quoted from the Prime Minister of Bhutan: "We know that true abiding happiness cannot exist while others suffer, and comes only from serving others, living harmony with nature and realizing our innate wisdom and the true and brilliant nature of our own minds." 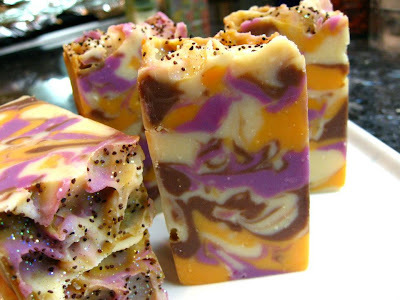 Anyway, let's go back to soap. 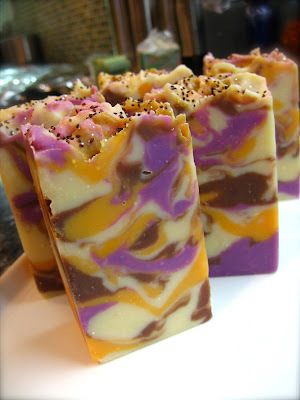 I found 2 kinds of handmade soaps in Bhutan, the one made with Yak Milk, and the other made with mustard seed oil. Apparently Yak milk is hard to come by, even for the Bhutanese. Yak can only survive on high altitude mountain top. And Yak is the animal of major protein and nutrient source for people living above 10,000 feet elevation. No wonder this bar of soap costed me $15 USD!!! 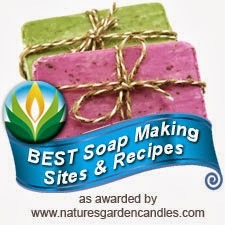 Who in the world would waste their food source for survival to make soap?! Only people crazy enough like me would! Oh trust me, I did try to look for canned Yak milk to carry back home, LOL. Now mustard seed oil might be exotic to us and hard to find, but I guess it's a none issue in Bhutan cuz that soap only costed me $3.60 USD. I can't wait to try both soaps! See this skinny Yak we encountered on the mountain, he's all shaved ready for the Spring and Summer to come, and we were at 11,200 feet above sea level.